The Catalyzing Entrepreneurship and Economic Development (CEED) Initiative works with UM students and faculty to build actionable partnerships with Mississippi communities. These partnerships will increase entrepreneurship and promote economic development in rural Mississippi communities. The CEED Initiative is funded with generous support from the Robert M. Hearin Support Foundation. Meet the 2014-2016 cohort here. Meet the 2015-2017 cohort here. Meet the 2016-2018 cohort here. Each year ten undergraduate students will be named McLean Institute Innovation Scholars. These will be exemplary undergraduate students with an interest in entrepreneurship and economic development in Mississippi’s rural communities. The two-year period for each project will be used to research a problem and to develop and pilot a sustainable and scalable solution. Solutions will take various forms: a business plan, a detailed framework for a non-profit organization, or a significant policy or academic research paper. Students will work with local communities to identify and refine compelling topics and to implement solutions. Projects will address social problems including poverty, education, asset building, and healthcare. Scholars are awarded an $8,000 scholarship for two years, with additional stipends available for fieldwork and internships. The McLean Institute will sponsor four graduate student Innovation Fellows each year. 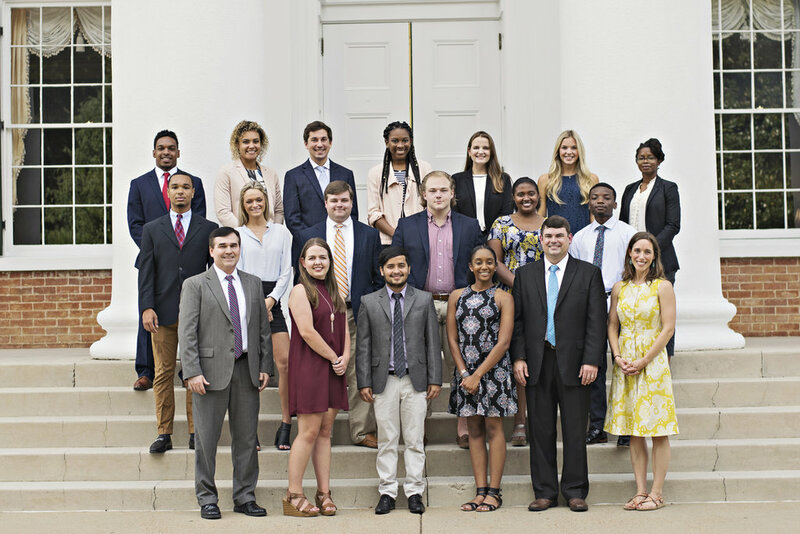 Fellows are exemplary students with innovative ideas for addressing poverty-related problems in Mississippi as graduate assistants affiliated with the McLean Institute. The two-year period for each project will be used to assist undergraduate Innovation Scholars research a problem identified by the local community and to develop and pilot, and evaluate a sustainable and scalable solution. Graduate fellows will work closely with faculty advisors and will meet regularly with undergraduate Innovation Scholars working on similar projects or communities. Fellows will receive $20,000 each year to cover in-state tuition, health insurance, and a living stipend. Fellows receive additional stipends for research/planning within their project area. Two grants are provided each year to UM faculty members seeking to conduct research in Mississippi. Supported projects focus on economic development and entrepreneurship. The program will encourage research that can improve the economic position of our partner communities. Faculty chosen for these awards present their research to campus and the public at large. Applications for research grants will be made available in November. Starting in the fall of 2015, the McLean Institute will sponsor an annual Rural Entrepreneurship Forum. The forum will showcase the work of students and faculty around the country working to support economic development and entrepreneurship in rural communities, particularly in the communities in partnership with the CEED Initiative. Each cohort of Innovation Scholars and Fellows will work in four rural counties or communities in Mississippi. Students will work closely with community mentors in one of these regions. The 2014-2016 cohort engaged with partners in Calhoun, Coahoma, Lee, and Tallahatchie Counties. February 2019. An Explorer at Heart, International Student Blazes Unique Path. January 2019. High School Students Learn Entrepreneurial Skills at Conference. December 2018. Fifth Annual Mississippi Entrepreneurship Forum Set For March 8. October 2018. Famed Mississippi Author to Share Inspiring Message with UM Students. October 2018. McLean Institute Expands Summer Entrepreneurial Leadership Program. October 2018. McLean Institute Grant Award to Fund Community Engagement. March 2018. McLean Institute, MDA Entrepreneur Center Set Spring Webinar Series. March 2018. McLean Institute Teams with Newton Schools for Virtual Reality Project. November 2017. Pharmacy Students Partner with McLean Institute to Make a Difference. November 2017. McLean Institute to Co-Host Pitch Night for Entrepreneurs. August 2017. McLean Institute Hosts Virtual Reality Experience. August 2017. McLean Institute ELC Program Helps Students Improve Communities. June 2017. McLean Institute Offers Summer Entrepreneurial Leadership Program. February 2017. McLean to Host Hope Credit Union Founder Bill Bynum. July 2016. McLean Institute Teams with Catholic Charities for Financial Education. July 2016. McLean Institute Give Youth Hands of H.O.P.E. June 2016. McLean Summer Program Turning High School Students into Entrepreneurs. May 2016. Kids in the Capitol Program Gives Fifth-Graders a Look at Government. February 2016. Clifton Taulbert to Deliver Lecture Tuesday. December 2015. Coast Native Takes Leadership Role in CEED Program. November 2015. Natchez Native Joins University’s CEED Program. October 2015. CEED Effort Focuses on Community Service. April 2015. McLean Institute Prepare to Launch Community Projects in the Delta.